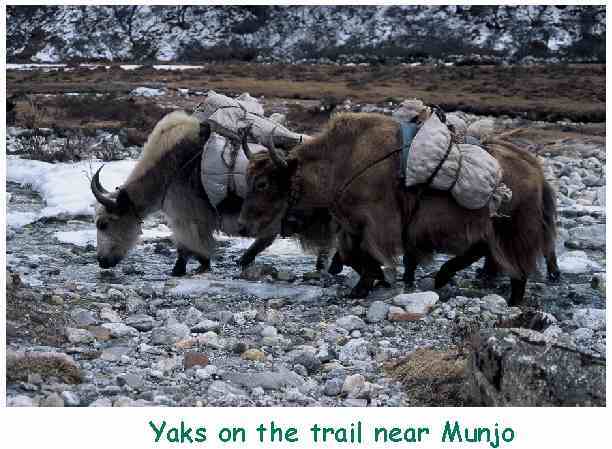 A trek in Nepal - this was a vision we have cherished for years since seeing slides of the majestic Himalayas. 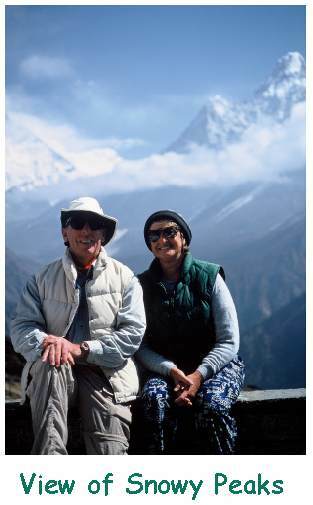 We spent 3 weeks in Nepal, 2 trekking to Gokyo Ri at 18,000', and had a fascinating time. Read on and we'll share the highlights. Kathmandu is an exotic city with Hindu and Buddhist temples, busy streets, choking smog, and hawkers everywhere. 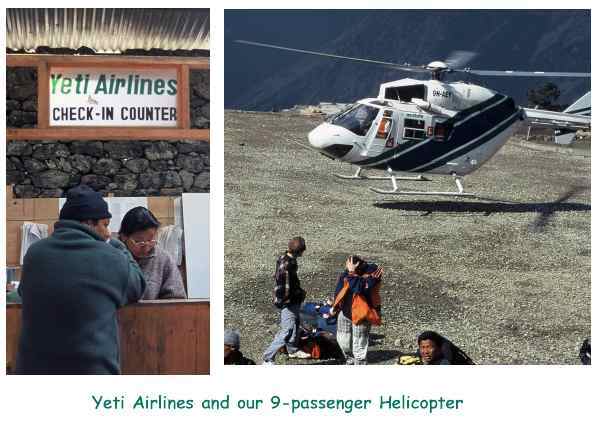 After 3 days we hopped a flight on Yeti Airlines (no kidding!) 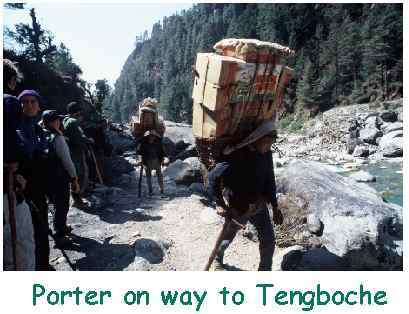 to Phlaphlu and a helicopter hop to Lukla, the staging area for all treks going into the Mt. Everest region. A meal of rice and potatoes, an introduction to the 'hole-in-the-floor' squat toilets, and we were off on a 3-hour trek to Phadking. 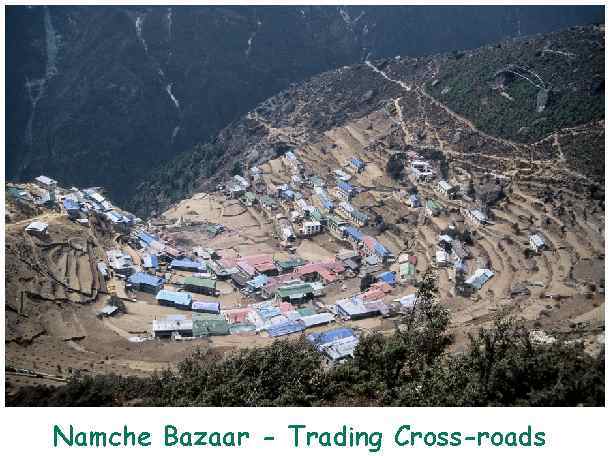 The next 2 days were tougher, as we climbed 800m (2500') to Namche Bazaar, an ancient trading outpost between Nepalese farmers and Tibetan traders who crossed the Himalayas to sell their wares. We also got our first views of Mt. 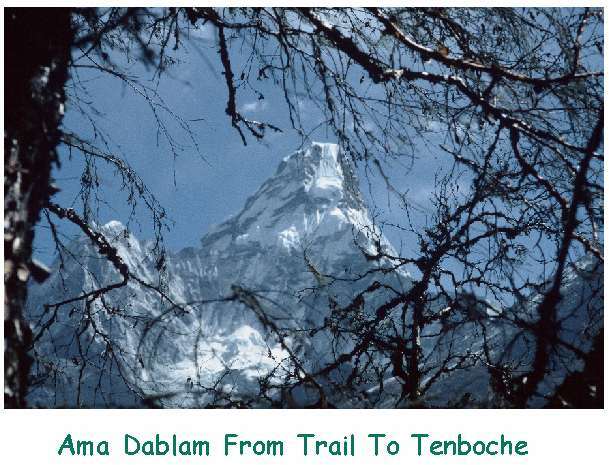 Everest and Ama Dablam. For hundreds of years, Namche has occupied a horse-shoe shaped hillside astride the Nepal-Tibet trade routes. Today, it also serves tourism, has electricity, a few phones and even a couple of internet connections. 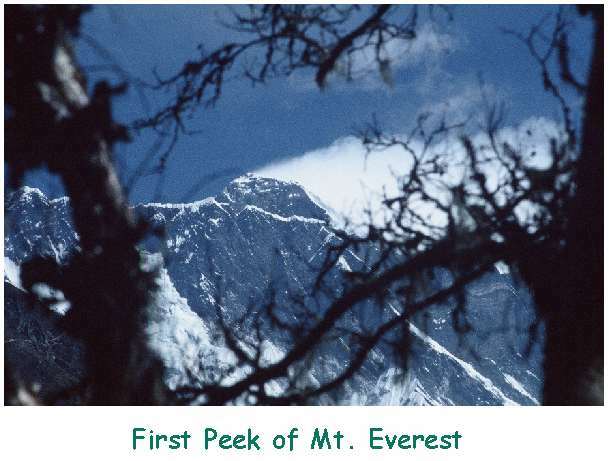 All Everest expeditions pass through and turn east towards Periche and the Everest Base Camp. We continued north through small villages, sharing trails with villagers, porters, and yaks, continuing to climb another 1200m (4000') to Gokyo lake, and the nearby peak of Gokyo Ri. The wake-up call came at 4:00 AM at our campsite and after hot tea and porridge 13 cold trekkers set out for the 18,000' peak of Gokyo Ri, and, hopefully, a clear view of Mt Everest. It was a tough, unrelenting climb and the thin air made us stop every 5-10 minutes to catch our breath. But the views from the top were worth every step - 360° views of snow-capped peaks, the Glacier winding through the valley below, and a solitary figure wrapped in robes meditating on the mountain-top. After much picture taking and posing we returned to camp, tired but proud of our accomplishment. 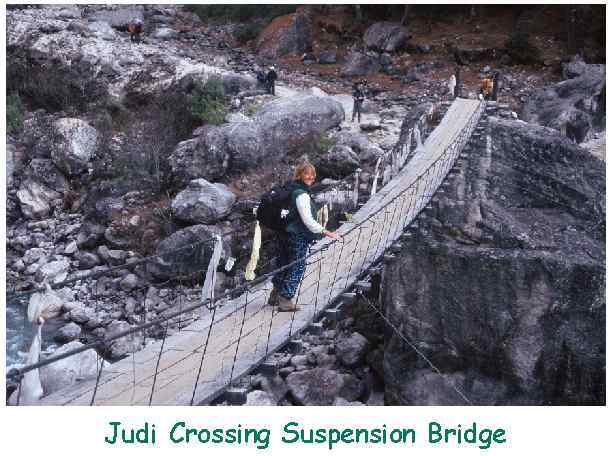 Over the next few days we gradually lost altitude as we crossed a glacier, trekked up and down interminable hills, walked across many suspension bridges, and finally arrived in Tengboche. Back in Kathmandu we tried to see all of the attractions we had missed earlier, but "traveler's tummy" plus a cough and the start of a cold laid us low and we took it easy until our Royal Nepal flight back to Singapore. Overall we had a WONDERFUL time and recommend it to any one. We went on a package tour with World Expeditions of Australia and were quite satisfied. There are scores of operators in Nepal, lots of lodges along the trails, and we met many backpackers of all ages who organized their own trips. Next time: Annapurna!